C.J. Redwine: Mega DECEPTION ARC Giveaway!! I can't believe it's been nearly a year since DEFIANCE hit the shelves. So much has happened in that year, but the one thing that never fails to amaze me about it all is YOU. I'm a big believer that having a diverse offering of books on the shelves is the best possible thing. Not every book is perfect for every reader. As an author, I'm not hoping that every reader will enjoy my books. I'm just looking for my tribe. The people who love my genre, like my writing, and want to live inside more of my stories. This past year, many of you joined my tribe, and I thank you. I wish I had a super cool secret handshake to teach you, but that would probably just be awkward. So instead, I'm celebrating my awesome tribe of readers with a Mega DECEPTION ARC Giveaway! You get an entry just for being the awesome reader that you are. All you have to do is leave a blog comment & take credit for it in the Rafflecopter widget! You get more entries for helping me spread the word about DEFIANCE and DECEPTION. Let's get to the prizes, shall we? 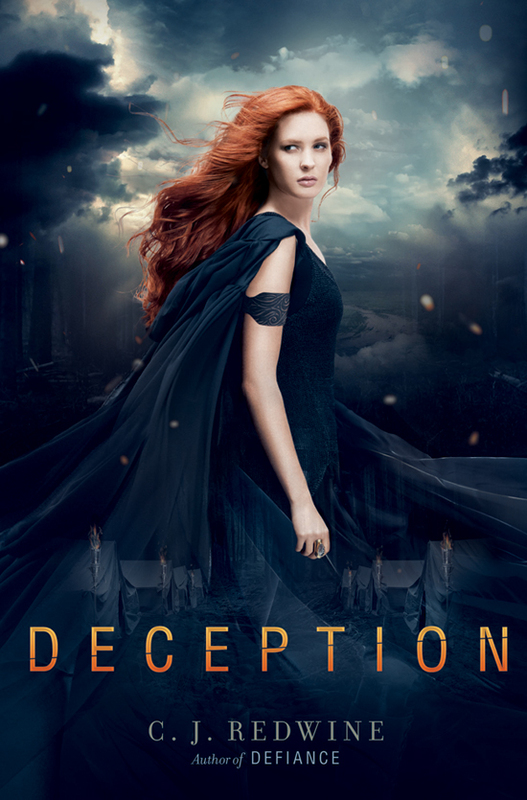 I am giving away three signed ARCs (Advanced Review Copies) of DECEPTION to three separate winners. I am also sending five personalized DECEPTION post cards out to five runner-up winners. The contest runs from today until July 22nd, 2013. Best of luck to all of you, and thank you so much for being one of my readers. You deserve magical unicorns and ninja kittens. YAY!! THANK YOU SO MUCH FOR MAKING THIS INTERNATIONAL!! (and sorry for all the caps, but can you tell I'm excited!?!?!). What am I hoping that will get fixed in Deception? I'm hoping they can discover who is the one really controlling the Cursed Ones... cause I'm afraid (and also looking forward to!) that we'll probably get more questions than answers this time! Awesome giveaway! I'm trying to remember what happened at the end of Defiance since I read it awhile ago.. but I think what I would like to see solved by the end of Deception depends on whether or not this is going to be a trilogy. If this is it, I need to know what's the deal with the Cursed One! Definitely the Cursed One!!! I need to know ALL!!! Can't wait to read it!!! The problem to solve - hmmmmmmm. Maybe how the Cursed One is controlled and how the Commander has so much control over it! I need to know where the Commander went and how Rachel and Logan are going to find him! LOVED Defiance - I have Deception preordered, but I'd love a chance to read it early!! I think we all want to know what happened to the Commander! And I also want more Logan and Rachel cuteness! Ohmygosh, this is such an amazing giveaway! I haven't read Defiance yet, but I will really soon! I found a copy of it while volunteering at the library, so I have it ready to read. :D I'd love to read Deception! Not entering the contest because I have an ARC. But I just want to say that I'm reading Deception now and it's awesome. Can't wait to share it on my blog. *bounces up and down and squeals* Yaaay! Thanks so much for this amazing giveaway! I adored Defiance and I can't wait to read Deception! *crosses my fingers* I hope I win! I hope we find out more about the Cursed One! I want to know about the time period between the Cursed Ones destroying civilization and the Commanders creating their own city-states; I think that would be really interesting. More Rachel and Logan would be great too (: Thanks for the awesome giveaway!! grrr every single time I try to enter, it says aw schucks like some shy, Old West child with manners, but doesn't enter me :(((( *sniff* I may cry. Ok. I'll try again tomorrow before I let out the waterworks. Anyway, I'd love to see where Rachel and Logan's relationship goes and of course there's the big mystery on the Commander. I want to know what happened to the Commander! Thank you so much for the giveaway, C.J. What an exciting time for you!! As I have told you, Defiance is my go to read for inspiration, so I cannot wait for Deception!I want to know why certain people seem to have "control" over the Cursed One and why the Commander is one of them! !I am also curious as to the title - Deception...leads you to believe something bad will happen!But most of all I want to see more of Logan and Rachel - they are so strong in their own rights, but make each other more so when together. LOVE THEM! I loved loved LOVED Defiance...in fact, a patron recommended that I (a librarian) should read it and I am so glad that I did! Can I just start off by saying I just finished Defiance and I looooooooooooooooOOOOOOOOOOve it!!! C.J. Redwine, you are one of my new favourite authors! And Defiance is one of my favourite books. And I want a Logan McEntire. I can't wait to read Deception. As for problems to be solved, I hope to find out who is controlling the Cursed One, but mostly I'm really curious as to what happened to the Commander. I'm also really looking forward to seeing how Rachel deals with the grief and pain she's been feeling over the traumatic loss of her Dad and Oliver. And how is Logan going to deal with his own pain and grief. In Defiance he did a good job of being strong for Rachel, but I wonder if it might get to him more in the sequel? I also wonder if Rowansmark will be a bigger part of the next book since there seems to be a rising war between the two city-states. One of the MANY problems I hope get solved is Rachel and Logan's relationship! They are sooooo right for each, and now that Logan wants Rachel things are to complicated! I really want them to work with each other and embrace each other! I can't wait! Oh, another things I hope is that they put the Commander 6 FEET UNDER!!! Rafflecopter name and Comment name is different! I want to know more about the cursed one! And this is very far fetched, but I want Rachel's father to be alive and that grave to have been a trick! Ack, I wish I remembered more from Defiance, but I know I loved it and can't wait for Deception, lol. THE COMMANDER! I really really am hoping he ends up dead. That it all. I want to know more about the Cursed One. Well... the Cursed Ones are really unknown. I want to know more about them! I'd like to know how they can get rid of the Cursed One and more of where it came from. First, Defiance rocked. I don't even want to say what I'm hoping for in Deception, because I just want to bask in what you've come up with (and possibly lock the book in the freezer for a while, depending on the circumstances).